Because Minnesota is considered an “at will” employment state, employment law disputes can be complex and confusing. When faced with an employment law issue, including unlawful discharge, discrimination, unemployment compensation, or workers’ compensation, you need an attorney that is experienced, aggressive, and knowledgeable. 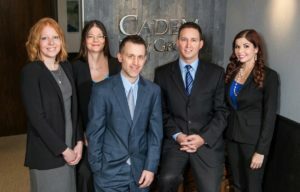 Cadem Law Group is qualified and experienced at representing both employees and employers alike. Representative cases include collecting $320,000 for a sales representative making roughly $30,000 a year when he was unlawfully discharged after suffering a heart attack, and successfully defending a family farm (at trial and on appeal) against a disgruntled employee seeking compensation for alleged back and neck injuries he sustained at work. If you have an employment law question, or are simply faced with a difficult circumstance involving your employment or an employee, contact our office online or call 218-739-HELP (4357) to schedule a free consultation to discuss your options. Key Practice Topics: Employment Contracts; Pensions and Profit Sharing; Unemployment Compensation; Workers’ Compensation; Harassment; Discrimination; Sexism; Racism; Discrimination based upon Age, Health, Disability, Family; ADA; FMLA; ADEA; ERISA; Family and Medical Leave; Special Compensation Fund; Minnesota Department of Labor and Industry.